It’s a dark and cold Halloween night. I have a four-dollar Chipotle Boorito in my stomach as well as some fresh produce and a bit of gear in my pack. I had planned to spend the night in town, but a last-minute change has me shouldering my pack, clicking on my headlamp, and hitting the trail. As children trick and treat their way through Manitou Springs, Colorado, I climb for home at Barr Camp. It has snowed since I left to visit family in Pennsylvania and even the early miles of the trail are covered in white. For a while I have good tracks to follow, but as I climb higher the snow deepens and the footprints lessen. After about three miles, only a single set of tracks remains. As the tracks diminish, so does my pace. And the temperature. And probably my morale. But I’ve done this cold, dark, snowy slog home plenty of times. 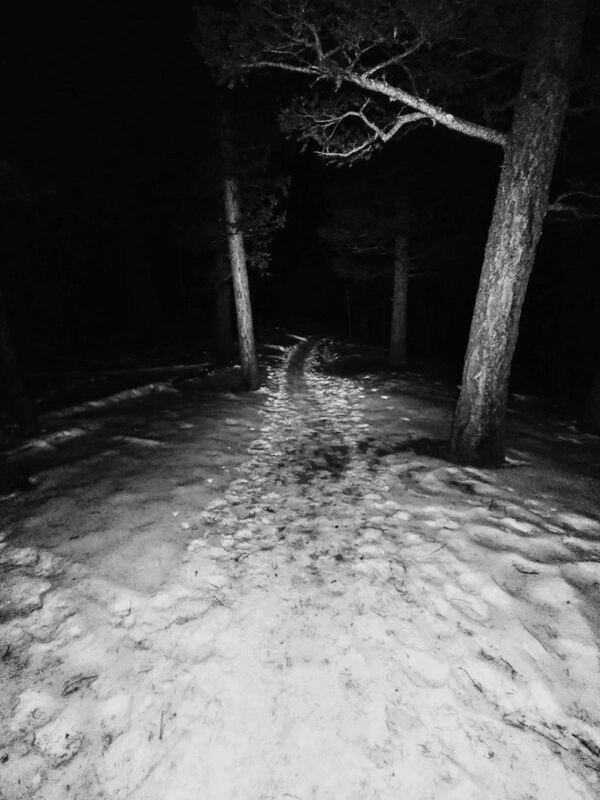 Thoughts of turning back, more thoughts about refusing to entertain those thoughts, hard intervals to generate warmth, frozen feet, clapping my hands, and the recitation of a few select “Rocky” lines are common occurrences on nights like this. Employing some of these tactics is also nothing new, though using them in the month of October, though not unreasonable, is a bit unexpected. After about four miles, I have had enough. I take off my pack and pull out a fleece jacket. This thing isn’t made for running, but it is warm, and that’s what I want. I zip it up, put my pack back on, and continue. Almost immediately I realize that I have forgotten to cinch my pack shut. There is gear back there, but I just want to be warm and home, so I let it go and keep trudging. With the fleece on, my core does alright but my extremities stay cold. By the time I reach the cabin, my hands and feet are struggling. Fortunately I still have enough finger function to unlock the door. Once inside I change, scarf down some food, and head to bed. The first screamin’ barfies of the season, I think to myself. It’s funny how quickly things can change. Earlier that day I was cruising the banks of Pennsylvania’s Susquehanna River as I logged some morning miles with my buddy Bobby Longenecker. Now I was crawling into bed at 10,200 feet in elevation, fresh off a snowy slog and a tussle with the screaming-barf monster. And the day before that? Well that day I hammered out some hard birthday miles on the Conestoga Trail to usher in my 30th birthday. Yeah, you heard it. I’m 30 now, or, as Grandpa Miller would have said, I’m in my 31st year. I remember when I turned 29. “Twenty-nine and holding,” my Mom said to me over the phone. Holding, I thought to myself, if you’re holding, you’re not going anywhere! I admit that turning 30 is a little strange, so I can understand why people are uneasy about growing older. But come on, we’re not supposed to stay in one place. We’re meant to keep going, to pass the time or have time pass us by or whatever you want to call it. We’re not supposed to stay still. If we do, we end up stuck in the cold. Then we get frostbite and eventually doze off, die, and become some memory of yesteryear. To me that sounds like a miserable time. The saying that time marches on is true. So if that’s the case, we should march with it. As you grow older, especially when you’re young, people like to ask what you want to be. Some folks have a very direct answer for that question. They say they want to be a doctor, a teacher, a lawyer, or something else. Others never seem to have an answer. “I’m still trying to figure it out,” they say. I’m cool with any answer. Why? Because I think that life is about becoming. Some of us know what we are trying (or longing) to be, and we move toward it. Others have no clue, but we keep moving anyway. All of that is alright, because the only real tragedy is to not move at all. Maybe this is why getting older is hard for so many people. The farther they go in life, the more they accomplish. But as they age, their becoming morphs into holding. Rather than climbing higher, they find a hold and hang on. Instead of becoming, and embracing 30 (or 40 or 60), they try to hold onto 29. They avoid what they fear, but in doing so put a nail in the coffin. This is one of the things I like most about running, the becoming. You become a lot of things when you run: fitter, stronger, faster, and healthier. Sometimes you become things that aren’t so good, like burned out, imbalanced, and injured. The same is true in life. Sometimes we become the things we desire; we are kind, loving, and understanding. Other times we become things we wish we weren’t, like resentful, bitter, or judgmental. It’s a matter of trial and error and we won’t always get it right. All this is kind of like the screamin’ barfies and my slog up the trail on Halloween night. Life will take us through some frozen, dark times. Our hands, feet, and hearts may grow cold. But if we press on and lean into becoming, we are bound to find a warm cabin in the woods. And at first the warming process may hurt. Cold fingers and hearts take some time to warm up and the sudden influx of blood flow may feel painful. This discomfort reminds us that we are still alive, and points to the good that is to come. I don’t know what you are trying to become in life. Maybe you want to be fast or strong or rich or loyal. I also don’t know what you have been in the past. What I do know is this: set your sights on what you long to be. Climb through the frozen night. Shake off the things that hold you back and become who you were made to be. And don’t be afraid to scream and barf along the way; that’s just a reminder that you’re still alive. Do you look forward or backward more often in life? What value do you find in each perspective? What do you think you are still meant to become? What does the journey to that look like from where you are? Do you ever find yourself, as Zach says, holding onto the past more than is healthy or useful? Happy birthday! A warm cabin in the woods at over 10,000 feet on a snowy night seems like a fine place to be on any night. As I get older, I am inspired more and more by the accomplishments of people who are even less young. For me, the most inspiring athletic achievement ever may be Robert Marchand’s world record last year for cycling about 14 miles in an hour at 105 years young. Why I think it is such an amazing record is not so much the distance, but the absolutely amazing smile and apparent tears of joy that he had at the end. https://www.npr.org/sections/thetwo-way/2017/01/04/508213332/105-year-old-cyclist-rides-14-miles-in-an-hour-en-route-to-a-world-record Good luck on continuing to climb through the night, and I hope you keep on writing! Thank you for this. Always look forward to your articles Zach and this one was just what I needed to hear. Very insightful. Keep’em coming and good luck at JFK! You’re welcome! Glad it was helpful to you. Thanks for reading! The metaphors from running (and slogging up mountains in the snow) that apply to life broadly are endless, and you hit on many of them poignantly in your writings. In response to Meghan’s questions about looking fore and aft, I would say that the ideal balance is found both in running and in driving: Have a destination, look forward (but not too far), take conditions around you into consideration, and use your rear-view and side-view mirrors only to inform of what’s behind. Look back too much and you’re sure to crash; live in the present and you will glide into the future in harmony. Happy birthday Zach! Needed this reminder to think about the ways in which I am letting myself get stuck and about who I am becoming. Thanks. That is what you are doing every time you set out on your next adventure! Thanks for sharing your contemplations on life with all of us. 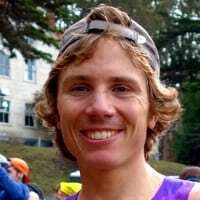 Thinking of you at this very moment since you have about five miles to go in the JFK 50 Miler. You are awesome! 30 is young. I turned 46 ouch! As always your writting is inspiring and insightful Zach! And always seems to come at the right time. I’m also planning to do some hard birthday miles in December. Happy birthday. Take care. Keep running and writing! Thanks Roberto! Happy Birthday (it’s December now!). 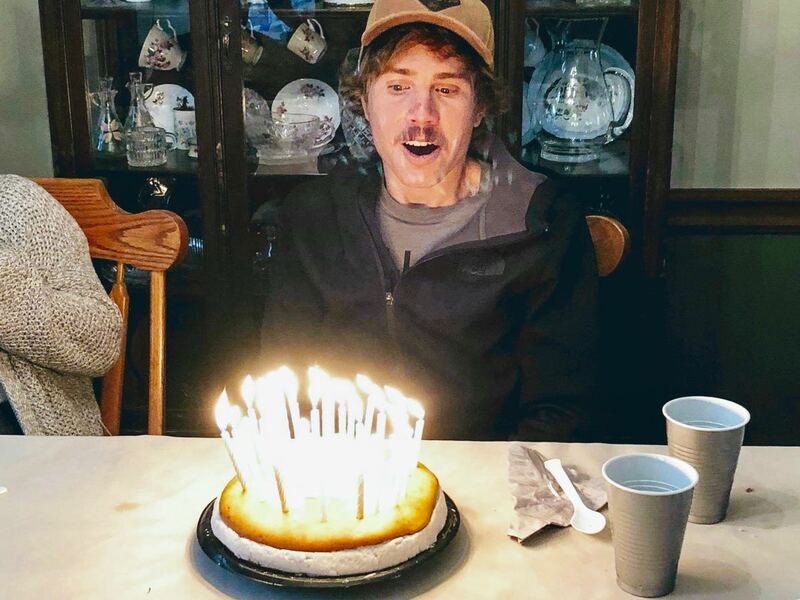 Zach – Happy Birthday! Thank you for your inspiring articles! I always look forward to them. As I am nearing 52 your words are a great reminder to keep getting after it! Well said! Thanks Michelle! I’m glad you liked the article. Happy early Birthday!